Mods make games, in general, more fun. Period. By giving players more content to play with they double, if not triple, the replayability factor of a game. That’s why mods are such a crucial part of a game’s community. Take Minecraft for example. WE LOVE MODS! Today we’re going to show you some amazing mods that you’ve gotta check out. Each of these mods are currently in their BETA phases so be sure to keep an eye out! Disclaimer: The mods below are still under heavy development and may contain some bugs. Depending on what else you have installed on your server, these bugs can corrupt your world. Finding proper documentatio can also be a challenge. We strongly recommend you back up your worlds before trying these out. Armourer’s Workshop tests a player’s creativity by allowing him/her to make their own skins for weapons and armor. The word “skin” is used here because this mod can not create new weapons and armors, just a new costume so your weapon or armor will have a new look. This mod has unlimited potential because it puts total control in the hands of the player. It allows you to create awesome costumes, like 3D wizard hats, viking caps, puffy dresses, light saber swords, and a whole lot more. The mod includes a Guide Book, equipment skin template, paintbrushers & rollers, color tool, burn tool, dodge tool…it’s basically Photoshop for your weapons and armor! One of our favorite things about this mod is that it’s compatible with other mods like Balkon’s Weapon, Tinkerer’s Construct, Smart Moving and more. Dragon Mounts is a well known mod that is still currently under heavy development. 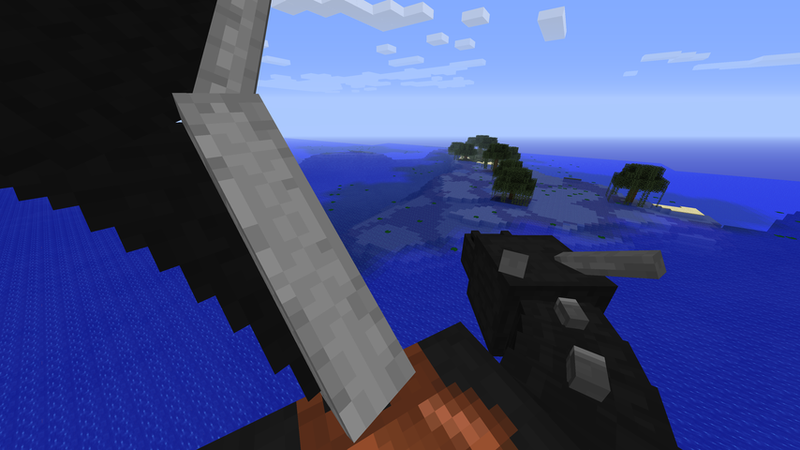 It is, however, already really useful, as it extends Minecraft’s vanilla end game. This mod allows players to hatch the previously useless Ender Dragon eggs and tame the new dragon to become a loyal companion using raw fish. The newly-created dragons can be saddled and ridden – allowing for a totally awesome way to fly. Dragons can hover in mid-air or be told to sit like normal dogs and cats by holding the vanilla bone item. As of right now, riding the dragons requires the player to use the vanilla Carrot On A Stick item to control it’s destination. Rails Of War is all about locomotive engines and steam-powered trains. 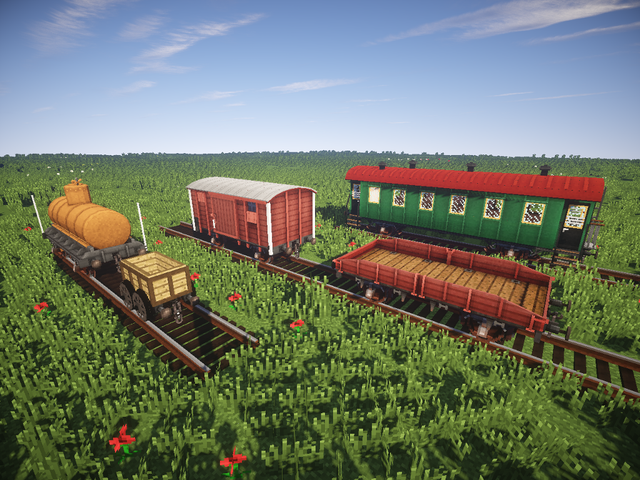 Created by Naiten, the Rails of War mod adds fully functional trains and armored trains to the game as a massive step up from vanilla minecarts. Currently there are no legit ways to create these trains because the recipes are not yet available – BUT all new blocks and items can be accessed through the new tab inside the creative inventory. Recipes will be added in the future, along with machinery, proper interactions, and other locomotive content. Nevertheless the train models in this mod are absolutely gorgeous, making it totally worth the wait! Driving a giant mech is every young boy’s dream, and PacifiCraft will surely make it happen. PacifiCraft is a mod based upon the 2013 film Pacific Rim, where giant monsters known as Kaiju invade earth. In the movie, humanity’s only line of defense is a team of giant humanoid robots known as Jaegers. This mod currently adds 1 Jeager (called Gipsy Danger), one Kaiju, 4 different pilot suits and a bunch of blocks (including a new ore) that comes along with it. The mod’s creator, JadeCreeper, had announced that the mod is nearing its first release and that he’s building a website for it. You know this one is going to be big! Do you love games like DayZ or H1Z1? If you do, then you’re going to LOVE the Last Days mod. 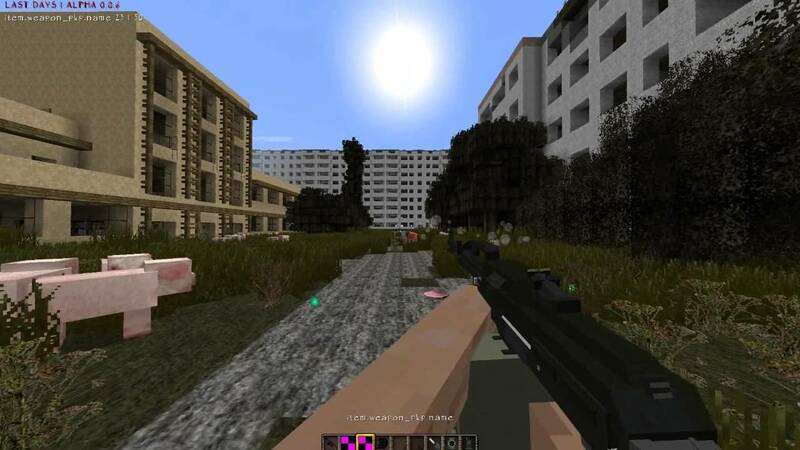 Noted as one of the best post-apocalyptic mods ever, Last Days overhauls the vanilla gameplay mechanism by adding dozens of new contents – everything from NPCs, guns, and generated cities. Heavily inspired by the game DayZ, this mod will blind you with hundreds of custom 3D models from guns and blocks to armours and miscellaneous gears. This mod also adds a custom inventory screen, unbelievably cool-looking gears, new food, blood & (a little) gore, realistic looking animated guns, dynamic crosshair, weapon attachment system, some evil monsters, backpacks, back items, and a custom world with generated cities, villages, and an airport. Total multiplayer support and a massive selection of 3D gears make this mod one of the sweetest out there that are still in Beta. Vampirism is a unique Minecraft mod that changes the player into a vampire with a nasty thirst for blood. As a vampire, players are stronger, faster and have other increased capabilities… at the cost of having a new-found desire for blood. Vampirism adds several rituals that can turn a player into a vampire. It also features dozens of new items, weapons, NPCs, vampire mobs (which are hostile to non-vampires), and a new game mechanic. Vampires have a different leveling mechanic, allowing the player to become even stronger and faster as time goes by. As a vampire, you will also take damage from the sun and will be hunted by well-equipped NPCs called vampire hunters. In addition, eating and drinking blood from living NPCs will turn them into the undead. This killer new concept makes multiplayer worlds even more interesting so be sure to check this one out! 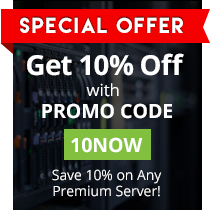 Host your very own lag-free Minecraft server with EnviousHost and try out all these amazing mods and more with your friends! Experience great performance, 24/7 support and the world’s greatest value while you play Minecraft. Bring along all your friends from all over the globe! And remember, EnviousHost also features server hosting services for Minecraft Pocket Edition (MCPE) and StarMade. Check us out today!